Home / Industry Blog / discovery / Great White Mystery? In 17 years of diving with the Great White Sharks at Guadalupe Island, we have learned a lot about these awesome creatures. From not knowing where they are heading when they leave the Island, to thinking they are heading to an area offshore to mate, to finding out that we were wrong on that and realizing that they are actually mating at Guadalupe, we have come a long way. What never ceases to amaze me is the fact that we keep learning new things and that things we thought we knew were actually wrong. Observing them over time has given us some insights into their behavior and how the relate to each other and how their personality changes as they grow. The most important thing I have learned is that just when you definitively think you know something about them, you find out that it may not always be true. First I have to make a disclaimer. I'm not a marine biologist, so most of what I know about their biology and migration I learned from my friends who are biologists and study these sharks. What I know about their behavior comes from literally thousands of hours spent observing them, both in the water and from above. The latest theory that has come into question is how the shape of their teeth changes as they growand the reason for that. Georgina French, a PhD student at the University of Sussex, published a new study that deals with that theory. 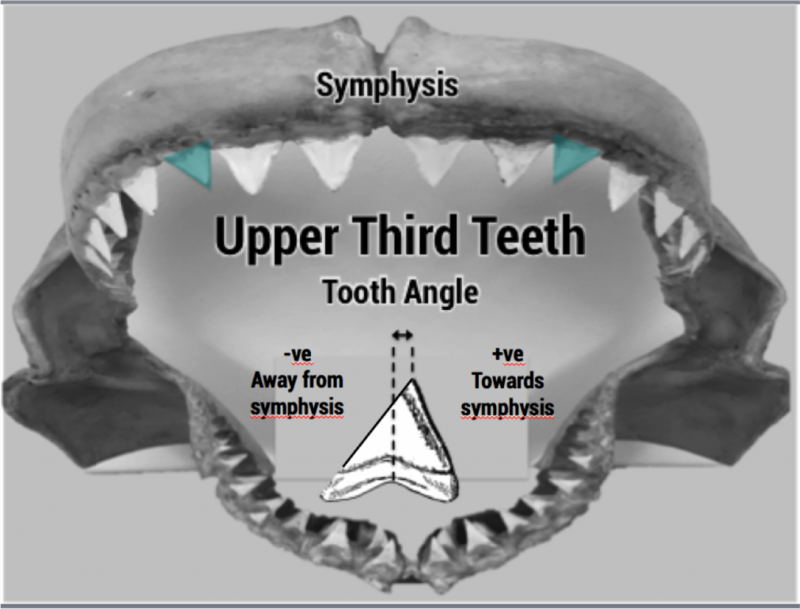 From her paper: Up until now, scientists have accepted that white sharks start out their lives with cuspidate (pointy) teeth, which are thought to be adapted for gripping onto slippery fish. When the sharks hit roughly 3m in length, they’re then thought to develop much broader teeth, which are believed to be adapted for catching and eating marine mammals like seals and dolphins. This shift in diet and tooth shape with age/size is referred to an ontogenetic shift. Her new discovery seems to be that there is a distinct difference between male and females, something I have never heard before. She writes: Previous studies of white shark teeth have always lumped males and females in together, despite the fact that they are quite different in other aspects of their biology and ecology. I decided to explore their tooth shape/shark length relationships separately. When I combined all of the data from the photographs, the literature and the KZN jaws, I found startling differences between the sexes. While males seem to follow the accepted pattern of broadening teeth when they get to about 3m long, females didn’t. Instead, a female of any size could have either broad, pointed or intermediately shaped teeth. Females also didn’t change the angle of their upper third teeth, while males did. Broadly speaking, the results indicate that either males and females are feeding on different things as they grow up, or that the tooth shape change isn’t related to diet. When sharks mate, males hold onto the females using their teeth. It’s possible that the broadening of the teeth and the change in tooth angle found in males could be an adaptation for mating, rather than for handling different prey. Alternatively, females with broad, pointy and intermediate teeth may be specializing on different types of prey i.e. they are polymorphic. I also found significant variation in the size at which males developed their broad teeth, which combined with other evidence indicates that some individuals mature a lot more quickly than others. 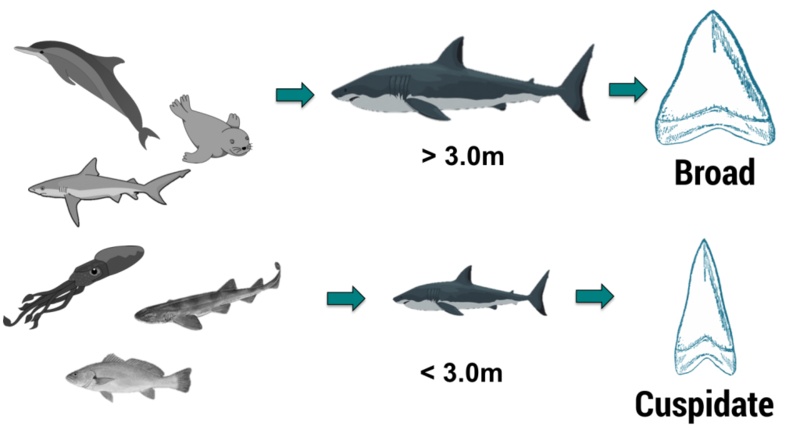 Polymorphism and differing rates of maturity among individuals can have pretty big ecological consequences, and these factors need to be taken into account in future studies and white shark management. This is what I love about working and diving with Great White Sharks. Every question that gets answered opens up a lot more questions. I wonder to what new insights about Great White Sharks this new discovery leads to. Maybe we should call these sharks Great White Mysteries instead. Let's go shark diving and discover new and exciting things about these awesome animals! By Shark DiverdiscoveryComments Off on Great White Mystery?